Creating a custom Lightning component requires programming skills. Or, you can install an existing Lightning component from the AppExchange. Point-and-click admins, you can do this unit! We’re providing you with a custom component that’s already configured. So don’t worry. You don’t need programming skills to earn this badge. You can create a custom Lightning component using two programming models, Lightning Web Components and Aura Components. See the modules Aura Components Basics and Lightning Web Components Basics. Custom components in your org that are configured for use in the Lightning App Builder appear in the Lightning Components pane. Configure the component and its component bundle so that they’re compatible with the Lightning App Builder and Lightning pages. Depending on the Lightning component programming model that you’re working with, see the Lightning Aura Components Developer Guide or the Lightning Web Components Developer Guide for details. Deploy MyDomain in your org. The custom component we’re providing for this module has already been configured for the Lightning App Builder. We’ve provided a custom Opportunity Alert Lightning component that you can add to your Lightning page. Let’s install it into your org. Copy and paste https://login.salesforce.com/packaging/installPackage.apexp?p0=04tj0000001mMYP into the navigation bar of your browser, and then press ENTER. The installation takes a few moments. After the installation completes, it’s time to add the component to your page. From Setup, enter App Builder into the Quick Find box, and then click Lightning App Builder. Click Edit next to the Top Accounts and Opportunities page. 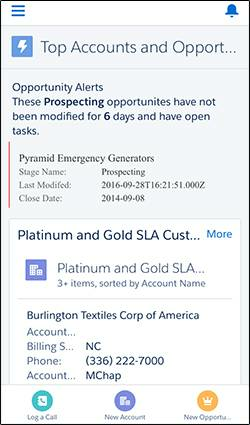 Add the OpportunityAlert component above the List View component. In the properties pane, change Days Since Last Modified to 6. Did you notice that the text inside the component changed to match the new field value? Because you activated the page previously, you don’t have to activate it again. All right! The changes you made are immediately available in Lightning Experience and the mobile app. Let’s see what the page looks like now. We’ll look at it in the Salesforce mobile app first. If necessary, log in using your Trailhead Playground credentials. Go to the Top Accounts and Opportunities page. 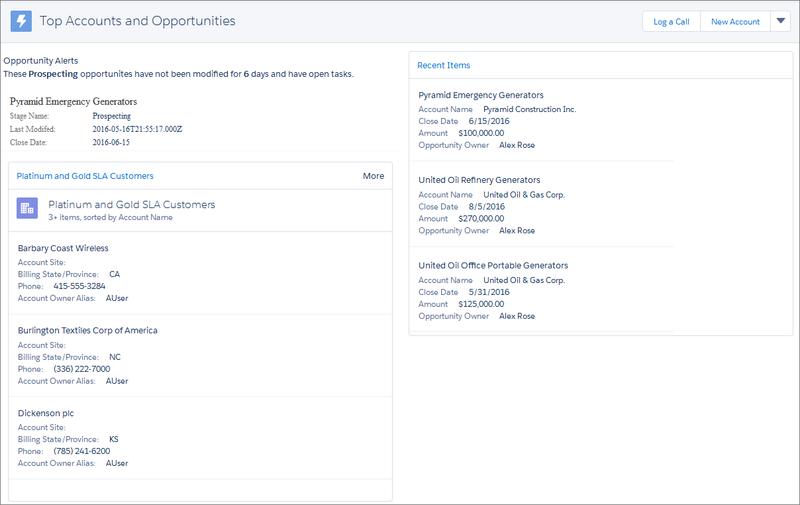 Go back to your org and view the Top Accounts and Opportunities page in Lightning Experience. Because you created the page using the Two Columns template, it uses the two-column format when you view it on the desktop or a tablet. Congratulations! You used the Lightning App Builder to create an app page, personalize your Lightning Experience Home page, and customize a Lightning Experience record page. You’ve got the skills now to make the Salesforce mobile app and Lightning Experience handier and more powerful for your users. Go forth and customize!